A national day of mourning has been declared in Italy on June 4, 2012, in honor of the earthquake victims in the region of Emilia Romagna. Italian and European flags will be flown at half-mast on public buildings in Italy, and a minute of silence will be observed in all Italian schools. Other initiatives will take place in individual towns, and television programming will be modified to include funeral coverage. The devastating earthquake of May 19, 2012 was followed by another quake 10 days later, leaving at least 20 people dead and 15,000 homeless. Damage to businesses and monuments has been extensive. 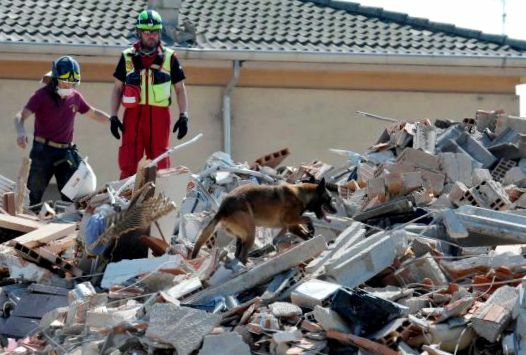 The area of Emilia Romagna hardest hit has been near the cities of Ferrara and Modena where agricultural concerns, (including the production of parmigiano cheese and aceto balsamico), manufacturers of ceramics, textiles and biomedical supplies, and many other small businesses have been forced to shut down. You can help by donating to the Italian Red Cross. Important note: Not all of Emilia Romagna has been damaged in the earthquake – fortunately all our friends in Bologna and Reggio Emilia are fine, having simply been scared out of their wits during the tremors, while experiencing no damage. This includes the wonderful Hotel Posta in Reggio Emilia, which continues to welcome guests as it has for the past 500 years, and is perfectly sound.